Reading period starts April 1st and ends on April 30th. 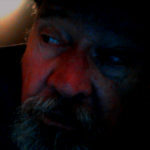 Enter 3 poems via poetraindog “at” gmail dot com . Pay the $15 reading fee (non-refundable) by using the PayPal button here. I prefer this method of payment but if you must pay by check or M.O. please make it out to Lummox Productions in the amount of $15 and mail to: Lummox – 3127 E. 6th St. Long Beach, CA 90814. 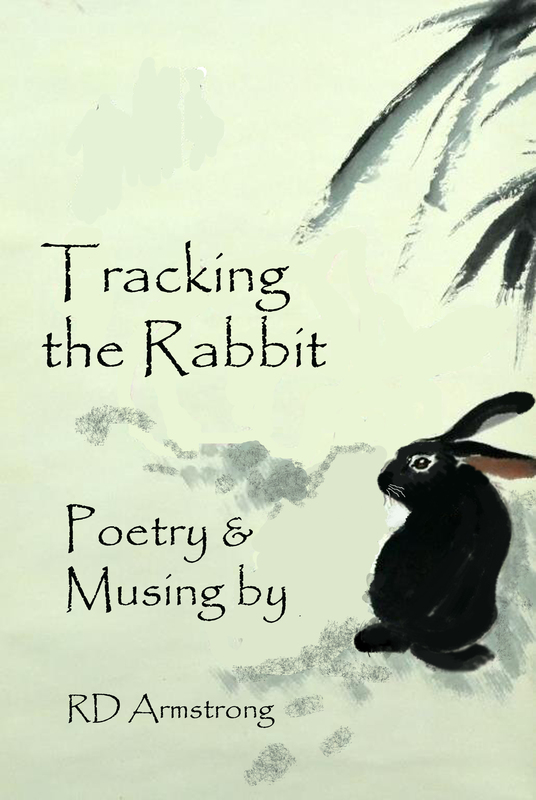 Please use “poetry prize” to identify what it’s for; or on the subject line of your check/MO. This year the Poetry Prize is $500 – FIRST PLACE, SECOND PLACE – $200, and THIRD PLACE – $100. WINNERS WILL BE ANNOUNCED VIA EMAIL (in late Aug. or early Sept)! I try not to send out too many emails (saves confusion) but please read the ones that I send you (important info within)…don’t be the one who tells me they didn’t have time to read it and wants special treatment. Hell! We all have to do the ‘work’…remember it’s all about your game! Though the Lummox Poetry Anthology has had a poetry contest for the last four years, from now on it will be the Angela Consolo Mankiewicz Poetry Prize (thanks to the generosity of her husband, Richard Mankiewicz). 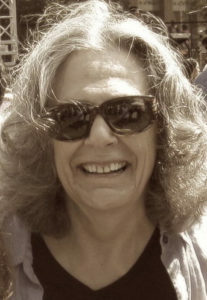 Angela (1944 – 2017) was born in Brooklyn, NY, but later moved to the west coast. She was fortunate to be able to devote two-thirds of her life to her true loves: poetry and theater. She authored hundreds of published poems and four poetry chapbooks, Cancer Poems, An Eye, Wired and As If and a recorded children’s story, The Grummel Tales. She was twice nominated for the Pushcart Prize in poetry. She also wrote a play that later became the libretto for “One Day Less,” a one-act operetta. 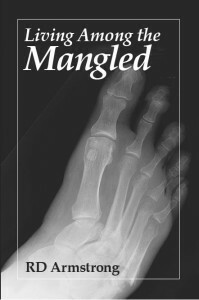 Throughout her life, Angela corresponded with hundreds of poets on all things poetic. She generously supported many literary groups such as Poets and Writers, Poets House (NYC) and Pen West. She was, to my way of thinking, a poet’s poet… and she was a friend of mine. It’s my fortune to be able to honor her memory with this prize. This entry was posted in 2018, ACM POETRY CONTEST and tagged angela mankiewicz, lummox press, poetry prize, RD Armstrong, senior poetry, women writers on July 29, 2018 by bookdog. Watch a video interview with RD and here him read some Orphaned poems. His first book in eight years. 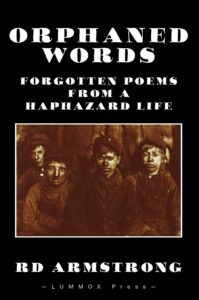 . . a collection of poetic “orphans.” Poems that had fallen by the wayside because they didn’t seem to be anything that anyone would want to have around (hence the “orphan”). The poetry in this collection hopscotches around encompassing the years 1993 to 2016. It represents the forgotten poems from four previous collections: Fire and Rain (Volumes 1 & 2), E/OR and the expurgated version, Living Among the Mangled. 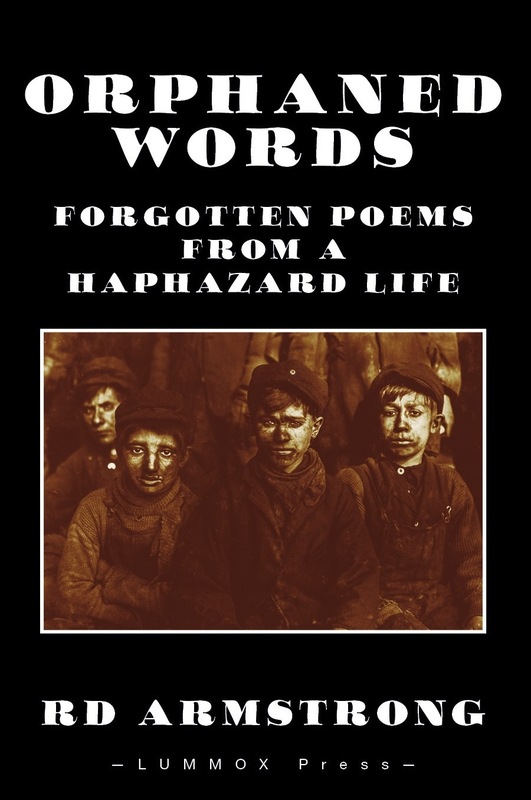 Remarkably, many of the poems are still relevant to the concerns that many of us have today. . . perhaps proving that RD is a savvy visionary or (more likely) that the story doesn’t change, only the characters do. We here at Lummox Press hope that you will find the contents of this book worthy of your time. 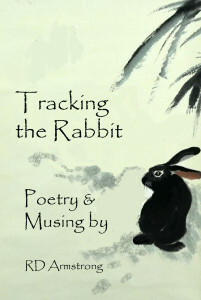 Read a sampling of poems here. An excerpt from the foreword. . .
To pay by credit/debit card (preferred) use one of the three buttons below: E-Copy (an electronic file – PDF – will be sent via email); USA (price includes shipping within the US); and World (price includes shipping outside the US). To pay in USD by check/money order, please pay one of the following amounts (E-Copy – $5; USA – $25; World – $43), make your check out to Lummox Productions and mail it to Mr. Armstrong c/o 3127 E. 6th St. Long Beach, CA 90814. Please allow 4 weeks for delivery. 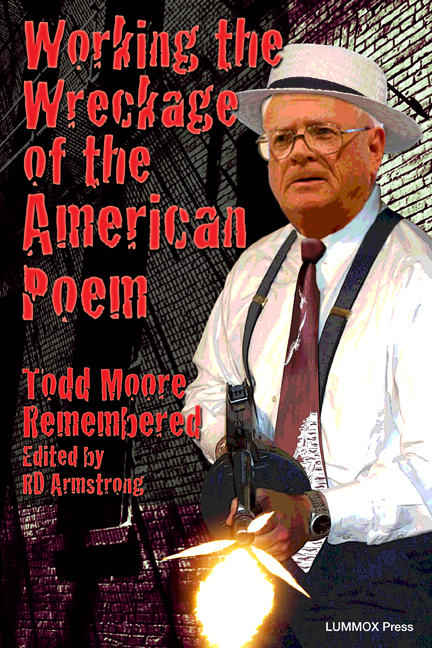 This entry was posted in 2018, Book, Merchandise, Orphaned Words and tagged americana, poetry collections, RD Armstrong, senior poetry on March 10, 2018 by bookdog. 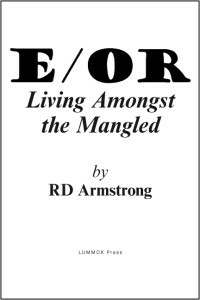 Internationally recognized publisher & poet RD Armstrong has been writing for over 20 years. Specializing in mostly poetry, he also has written prose, essays, articles, reviews & interviews, many of which are showcased in his numerous projects put out by his Lummox Press. 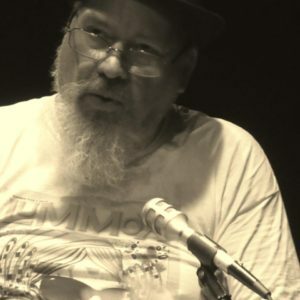 In the Lummox Journal (1995 – 2006), RD wrote a lead essay for each issue, conducted interviews with over 100 poets, writers, musicians, artists and even a dancer, over the course of its eleven year existence. He has also edited the annual Poetry Anthology simply entitled Lummox, for the past 7 years. He’s self-published (in the proud tradition of Walt Whitman) 6 full sized collections as well as 11 chapbooks and was published in 2 full sized books and 2 chapbooks published by other presses. In addition to that, he has been published in over 300 magazines. journals, and online sites. This last number would be higher if he hadn’t spent so much of his time running the Lummox Press and helping hundreds of poets. The titles listed below are all perfect-bound paperbacks. All are published by Lummox Press. Volume one of a two-part set featuring selected poems from 1993 to 2007, including some of RD’s ‘signature’ poems, like “Eyes Like Mingus”, “Pueblo de las Putas” and “Corazon”. These are poems you might hear him read at one of his many features in the Small Press poetry scene. 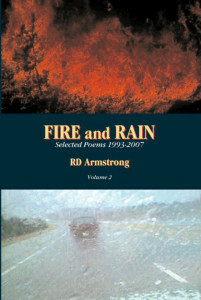 All the poems in this two volume set were hand picked by RD as his personal favorites. 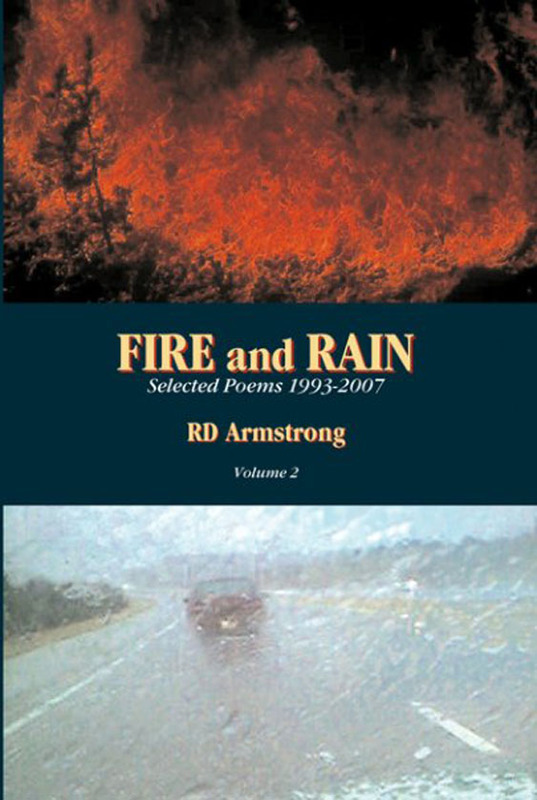 Volume two of a two-part set featuring selected poems from 1993 to 2007, including some of RD’s ‘signature’ poems, like “Yardbird Burned”, “Sanitized for Your Protection” and “Things I Notice 4”. 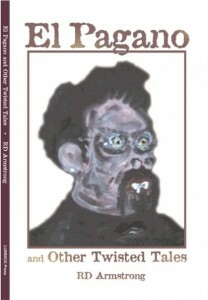 These are poems you might hear him read at one of his many features in the Small Press poetry scene. 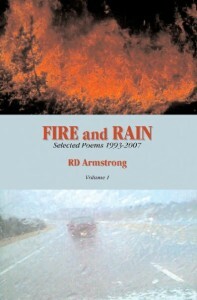 All the poems in this two volume set were hand picked by RD as his personal favorites. Three poems written about road trips…the lure of the road, the frantic pace of mile upon mile, hour upon hour, the mad rush of the journey between Point A and Point B. 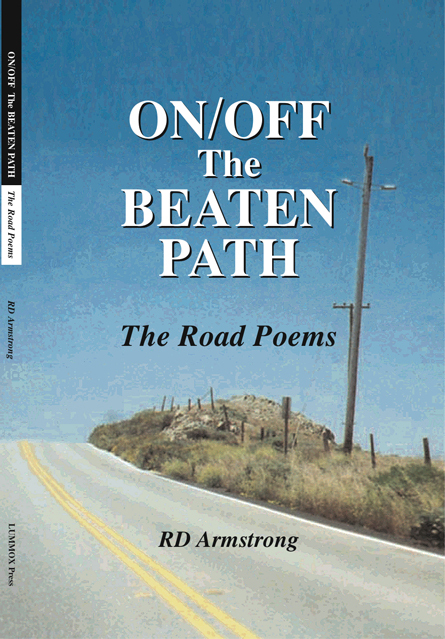 Contained in this volume: A Journey Up the Coast; On/Off the Beaten Path; and RoadKill (RD’s epic about a 3,000 mile romp undertaken right before Sept. 11, 2001; a 10,000 plus word monster). 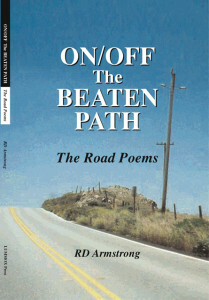 Ride shotgun with RD as he muses about poets, poetry, friendships forged on hot asphalt and things observed from inside the cockpit of a car hurtling down the interstate at 65 + MPH. The stories in this slim volume, reflect the influence of Charles Bukowski, whom RD has read extensively. But as was noted by one of his fans, this collection of short stories “Out Bukowski’s Bukowski!” These are tales of extraordinary madness. And while they might appear to be autobiographical, they are not, well not really. RD plays pretty fast and loose with the “facts”. Near the end of 2008, RD wound up in an L. A. County hospital for 14 days. He nearly lost his right foot to an infection. It was during that time that he was diagnosed with Diabetes. It was a sobering experience (literally!). This collection of poetry and blog entries describes that time period, from the beginning of 2008 (the drunkard’s lifestyle) to the end of 2010 (reformed and living right). It includes everything he wrote about that time…the good, the bad and the horribly ugly! A rough-and-tumble look at health-care for the poor and drunken and the questionable coping methods used to get by. This is the leaner, meaner fighting weight version of E/OR. All the beautiful pieces with none of the fat. When my dad died, I had some difficulty dealing with his demise. I had mixed feelings…on the one hand I was deeply saddened by his loss, especially since I had gotten to know him and had earned his respect during the last decade of his life; and on the other hand, having visited him in the senior ‘warehouse’ and seeing how utterly miserable and alone he was (lost in his dementia)…I was glad his suffering was at an end. 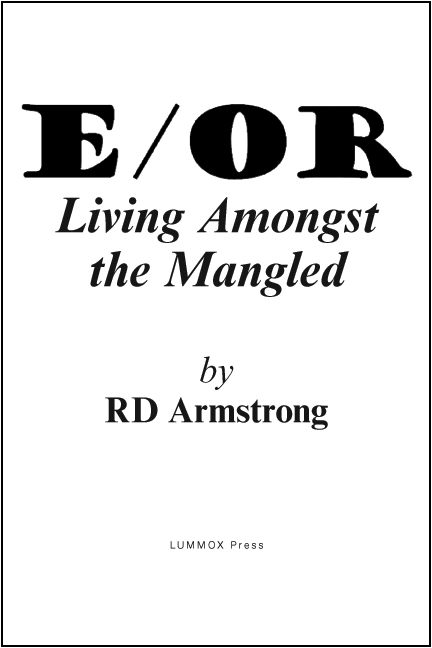 This chapbook concerns itself with the way I dealt with his death. I employed a “spirit animal” to help me resolve my grief and make some sense of it all. 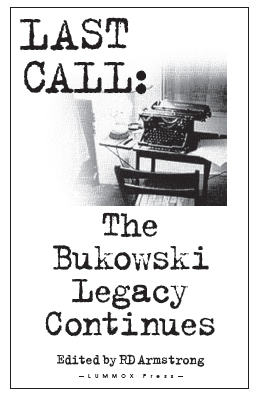 This is the reprised version, new and improved, and ready to take up the banner dropped by the old man so many years ago (we just celebrated Buk’s 93rd birthday in Aug. of 2013). If you ever wondered what Bukowski spawned by his example, then you need to read this book, which contains poetry, fiction, essays and artwork all inspired by the old dog! This entry was posted in Book and tagged best poems, L. A. Harbor area poetry senior poetry, poetry, poetry collections, RD Armstrong, senior poetry on August 19, 2013 by bookdog.